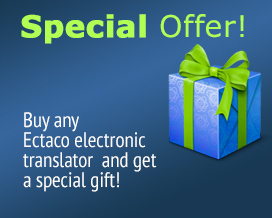 The new English dictionary from ECTACO is a truly useful reference and studying aid. It features the 70,000-word WordNet dictionary with phrase read-back capabilities, user friendly look-up options, and detailed explanations for each term. Multiple reverse explanations make navigating the dictionary more convenient. Improve your language skills with this dictionary.